Click on the image to download the HEIA Mental Health and Addictions Tip Sheet. CMHA Ontario recognizes that equity issues in mental health have a significant and often negative impact on the people, communities and health system of Ontario. 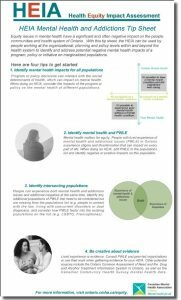 To help, CMHA Ontario developed the Health Equity Impact Assessment (HEIA) Mental Health and Addictions Tip Sheet in 2017. This Tip Sheet focuses specifically on how the HEIA tool can be applied to consider equity issues related to serving clients with mental health and addiction issues. Click here for the webinar delivered in partnership with the HEIA Community of Interest on this Tip Sheet. Developed by the Ministry of Health and Long-Term care, the HEIA tool is a decision support tool that enables users to consider how a program, policy or other initiative will positively or negatively impact on different population groups. On July 17, 2014, CMHA Ontario partnered with the Ministry of Health and Long-Term Care, Health Nexus and CMHA Toronto to offer a training webinar about using the HEIA Tool in Community Mental Health. CMHA Ontario has been actively involved in addressing equity in the mental health and addictions sector, producing resources such as the Advancing Equity in Mental Health in Ontario framework, which aims to increase understanding and dialogue within Ontario’s health system by creating a common language for talking about equity issues in mental health.